We have prime markets available for development and are eager to award them to the right candidates. If you are ready for a franchise opportunity that offers the potential for a great return on investment, diverse development options and innovative ways of conducting business, we hope that you will strongly consider a Captain D's franchise. 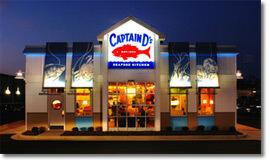 Captain Ds is part of Sagittarius Brands, the owner of Del Taco. Certain markets will be considered for co-branding opportunities in the coming years, and certain franchise candidates may qualify to develop both brands. Please inquire for more details. Please remember that we do not consider candidates without the appropriate operational partner and that we are not qualifying candidates for international opportunities at this time.